The best selling PC game of all time! Need more? OK. You have so much freedom for creativity, planning, control and manipulation producing an infinite amount of scenarios that produce astronomical replay value. Players can choose to meet the Sims needs or neglect them and cause sometime irreversible results such as death of the Sim. There’s no profanity since the dialogue is all jargon, but the tone is there. The game also pixilates Sims when they’re using the bathroom, changing clothes or taking a shower/bath. There is also no inappropriate sexual “hanky panky” unlike all the following installments in this game series. Factors you monitor to keep your Sim happy include body, charisma, creativity, repair, logic, social and, most importantly, bladder. You also have the power to control each Sims move or let them conduct themselves as they see fit. The learning curve is relatively small (you spend a lot of time building and designing houses), but if you’re already hooked on this free flowing simulation world, you already know any time you spend should fulfill just about anyone’s entertainment needs. An essential title! Game systems: The Sims game franchise takes it to the next level by allowing other players to become Sims themselves in a free flowing environment full of entertaining and intriguing elements. You even get a “backup bench” with the ability to create a maximum of three Sims. This element brings such a personal touch while perhaps echoing your real life characteristics. Maybe you create yourself, then your ideal self, plus a fantasy version of yourself. You can test all of them in the real time environments and see which one has the most success. This suggestion represents one of the many roads you can take down an infinite set of possibilities. Freedom does come at a price. First, the hardware for using the on-line capabilities, plus the subscription price. The Sims also has game modes for players who don’t have their networks yet (you’ll definitely want on-line capabilities eventually to experience the full potential of the game). Second, disrespectful people who choose to offend others. On the flip side, people will definitely use this platform to irritate and offend others just because they can, from a place not easily tracked. Luckily the game keeps the offensive options limited, which is still a bit unsettling, so keep this theme in mind while on-line – it’s only a game, it’s only a projection of you. Also, gamers used to the PC options and gameplay may have a bit of a learning curve when adapting the changed layout. Don’t worry; you get support with the “Get a Life” mode which teaches you the newer elements. This minor task is definitely worth the results. A highly recommended game (**** out of four stars – a perfect score!) for all audiences complimented by an extremely high replay value and overall appeal. Don’t be surprised how fast time flies by as you play. This review originally appeared on Entertainment Scene website. 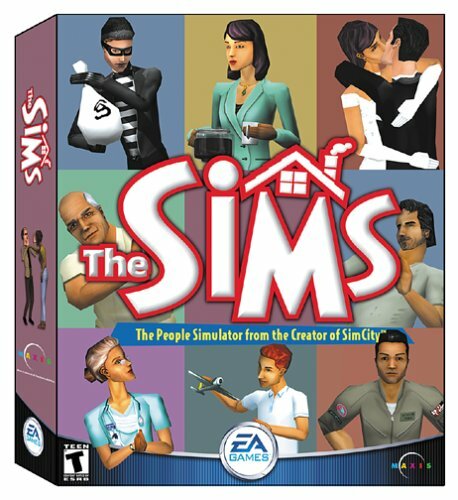 The Sims released on February 2000 (PC), January 2003 (PS2) and March 2003 (GameCube, Xbox). This entry was posted in Video Game Reviews and tagged EA, Maxis, Michael Siebenaler, Mike Siebenaler, Sims, Tall Writer, The Sims, video games. Bookmark the permalink.